Mirabile dictu! 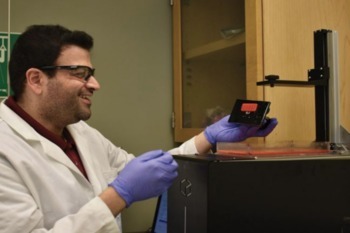 Researchers at Washington State University created a prototype that could reduce the cost of treating the two leading causes of blindness in America, diabetic retinopathy and age-related macular degeneration (AMD). The prototype is called a microneedle array; apt considering the device consists of a cluster of hundreds of tiny needles. The technology is essentially a patch for the eye which could make delivering drugs to the eye more effectively than the three current techniques: laser therapy, direct eye injections, and eye drops. Please contact SDCB to learn more about our exciting programs for people living with blindness and visual impairment.